It might be easy to dismiss squabbles associated with hybrid electric vehicle charging stations as a high class problem. Yet according to JD Power and Associates, these vehicles are expected to account for 10 percent of all vehicles on the road by 2015, which makes it an issue for everyone especially business owners. Having parking lots that are easy to maneuver, enter / exit, and park in is important for customer satisfaction. It goes without saying that easy-to-read, properly posted signs are a crucial component to managing a safe parking lot. Add to the mix charging stations for hybrid electric vehicles (HEVs), and the situation can get more complicated. Because such technologies are new and unfamiliar to some, it is important to post proper HEVs signage. 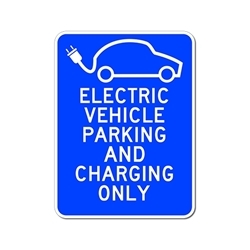 For instance, if your parking lot has or is thinking about installing a HEV charging station, consider posting proper signage that states “Plug-in Vehicle Parking Only” or a similar variation. Otherwise, non HEV owners may not know they cannot park there. Furthermore, the sign clarifies that HEV drivers cannot just park their car at a charging station for convenience purposes under the guise of charging their vehicle. Until such conventions become more commonplace in society, such signs are needed to inform and educate drivers all drivers as to what is expected of them. In addition, consider demarking specific parking spots for drivers of HEVs. By giving such drivers priority treatment, you are showing your support of the environment and green business initiatives. These drivers are likely to appreciate the gesture and return for repeat business.